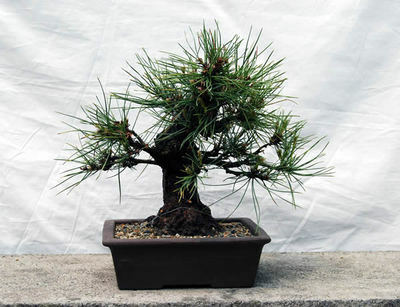 There are many processes before the commercialization of pine bonsai. The potting to transplant a pine from the field to a pot is one of the important ones. Same as grafting and repotting, this is like a major surgery for trees. Satoru Oro, Kyokushoen bonsai garden in Takamatsu's Kinashi town, quited his company and inherited the family business in 2000. So his career in bonsai is only for 8 years. But, with the knowledge during the department of agriculture of his university, he studies bonsai earnestly. Many growers start to pot Kuromatsu in the middle of March. In autumn, they prepare to cut the roots for the potting in spring. But it is hard to finish the work in the best season of cutting because of the large cultivation in Kyokushoen bonsai garden. He completes the work in the beginning of spring and then starts the potting in the middle of April when the buds come out from the seed leaf and many other growers finish the work. It is said, "Do not pot when the buds start to come out." About 5 years ago, he tried to pot after budding in the full knowledge of the best season. The percentage of rootage of Kuromatsu which is full of vitality was 95. After all, he succeeded the laborsaving way. Recently many growers wash the roots to remove the soil and use the new one in pots for the growth of new thin roots. However he uses the field soil in a pot following the traditional way. He develops a new species of Kuromatsu who tries to make bonsai with the fresh idea. 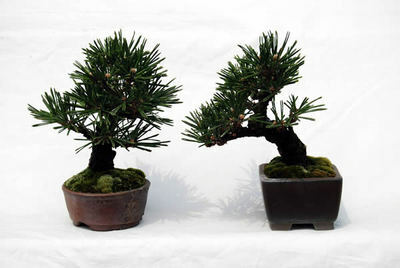 It is Yatsubusa type, and has very split trunk and good characteristics of needles. The dark green needles are thicker than "Kotobuki." And the trunk gets thicker soon. So even the 6 years-old tree has the good taste. The budding from the branch is fast. And it is easy to arrange the shape. The name "Kyokuryu" was chosen from among the public and named after his bonsai garden. There is a mother tree from an island of Seto Inland Sea at his garden. Now he sells some shohin trees grown by grafting.